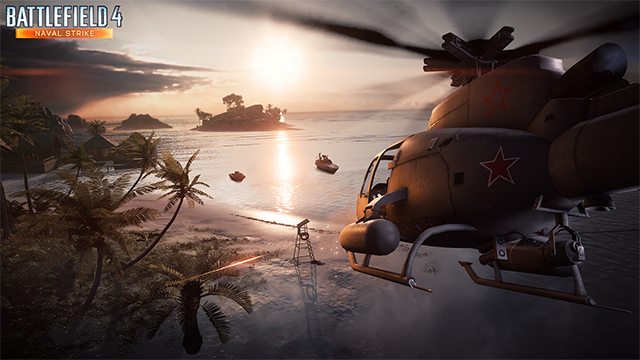 In Battlefield 4: Naval Strike, dropping later this month for Battlefield 4 Premium members, DICE wants to do Levolution a tad differently. Rather than wowing audiences with spectacle or destructive events, the studio has “been focusing on how the player can interact within the levels to create and block paths for vehicles, or make other strategic use of the environments,” writes DICE in the latest Battlefield Blog update. Though weather effects will be a part of what Naval Strike has to offer, the studio isn’t interested in “copying” popular Battlefield 4 maps like Paracel Storm. What’s your take? Sounds interesting enough? Don’t forget to learn all about the new Carrier Assault mode here, a returning favorite from Battlefield 2142.